New Swedish Psychedelic Discovery: Les Big Byrd - "Back to Bagarmossen"
It's a great, expansive psychedelic track that bears the imprint of their producer, Brian Jonestown Massacre's Anton Newcombe. The EP is available via PNKSLM Records - you can pre-order limited edition vinyl now, and it'll be out next week (Feb. 20). When we introduced Bypassers to our readers last April they were based in Helsinki and getting good press for a two-track single. Since then the band have relocated to London and released a fine EP. Consisting of four tracks, the music will favorably bring to mind the big sound of Britpop bands such as Oasis, The Verve and Stone Roses. Bypassers do it well, and they do it right, emphasizing the music rather than the sneer. All of the tracks on the Bypassers EP are melodic and charming, but I favor the first two tracks and have presented them below. The entire EP is available to download at the Soundcloud link below. Bypassers are Niilo Klemetti (vocals, guitar), Markus Muinonen (bass), and Juho Orjala (drums). 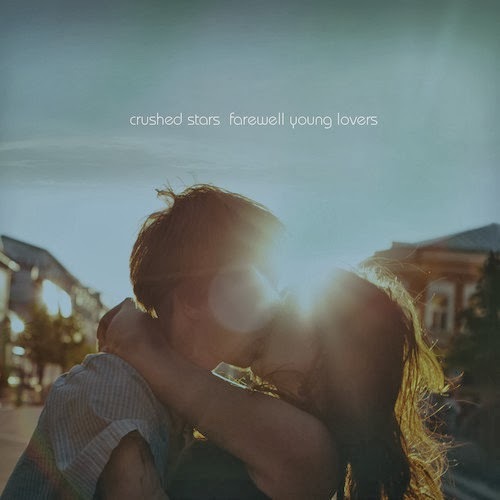 Farewell Young Lovers is the newest album from Dallas-based dream pop band Crushed Stars. In case you're not familiar with them, Crushed Stars is multi-instrumentalist Todd Gautreau along with drummer Jeff Ryan (War on Drugs, Baptist Generals). Known as a studio-only band, Gautreau has made no secret about his desire to build a musical following without having to hit the road... and with music this good, he's on the right track. I hear hints of another Texas outfit, American Analog Set, in spots... but in others, the influences of Jesus & Mary Chain and Echo & the Bunnymen are apparent. You may hear other influences of a similar vintage. The music is an engaging combination of treated guitars, synths (even a theremin) and both quiet dream pop and upbeat dance rhythms. But there are quieter songs, like the beautiful, hushed "Fly", and "Poppies" which is a longish, subtle instrumental. Not only do they demonstrate Crushed Stars' facility with all types of music, they work very well to keep the album from sounding the same, and wearing out its welcome. The longest track, "It Happens Every Time", is pure 80's guitar pop, reminiscent, to me, of that 80's generation of Roxy Music/Eno descendants like New Order, The Cure and the ones mentioned above. It's a very well-done album with a compelling variety of sounds, all pulled together by Gautreau's vocals. Look at this record as a worthy Valentine's Day present from This Is American Music. The Party Dolls are an ad hoc collection of members of The District Attorneys (frontman Drew Beskin, Frank Keith IV, and Walker Beard), Tedo Stone, and Crooked Fingers (Jeremy Wheatley), with some contributions from other friends. The band was born a year ago in Athens, Georgia when the other members of The District Attorneys couldn't make the show and Beskin invited Stone and Wheatly to join in. They learned some songs Beskin had been inspired to write in the aftermath of a bad romantic breakup. Beskin believed that the songs wouldn't fit the sound of The District Attorneys, but would be right for this assemblage. The result, one year later, is Love Wars Baby. 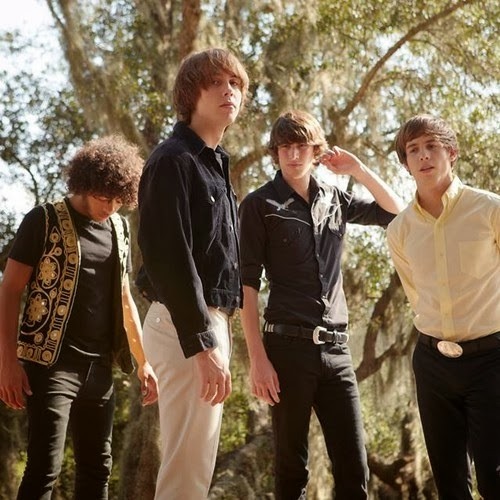 The sound includes the fuzz, jangle and southern rock elements that you would expect, as well as some sweet hooks and harmonies to accompany the pain and heartache. There are jaunty songs such as "Kindly Leave", ballads like "Vampire", the heartbreaking "Firecracker", and the barroom sing-a-long of "Sweetheart Moon". And the performances are so tight that you will dismiss any thought that the band is a side project. This album has my high recommendation. You may note that two of the songs below are available to download, but that only gets you a small part of the album. Find it at the label site, find it at Bandcamp, find it at digital purveyors (you know who they are). Just find it. Lost in all the talk about Keith Richards' guitar heroics, open tunings, drug habits and lifestyle is the fact he's a very good songwriter. 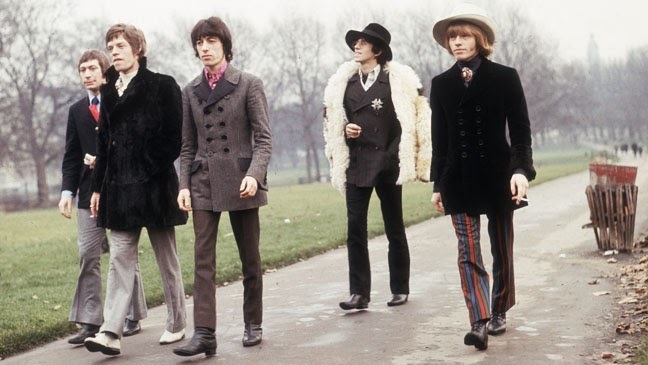 One of the first Rolling Stones songs that hooked me as a kid is "Ruby Tuesday", recorded in 1966, released in January 1967 when it quickly soared to #1 on the charts. The lyrics and original melody were reportedly written by Richards, with help on the music later from Brian Jones. Richards' lyrics were about either a groupie or his girlfriend of the time Linda Keith. But hey, I was 10 year old and knew nothing about groupies, but was drawn to the terrific melody and overall sound of the song. I love how the chorus builds and gets repeated at the end. Brian Jones' piano sounds great too. In contrast to Richards' tough guy persona, there is something very warm and affectionate about the song both from its sound and lyrics. Solomon Grey is the duo of Tom Kingston and Joe Wilson. They have spent several years writing and producing their debut album, residing in the UK, the west coast of Ireland and the Australian outback. The album is expected later this year. "Last Century Man" is the B-side for their recent Firechild single. The track will feature on the Kisune label's upcoming New Faces compilation, and is the subject of the colorful, CG-created video presented below. Firechild was released on Black Butter Records. Mississippi tortured hard folk duo Water Liars are back with a third album fairly quick on the heels of last year's Wyoming. "Hard folk" is about the best I could come up with to try to encapsulate the contrasts within their music. The lyrics are provocative and arresting... opening track "Cannibals" draws an analogy: "When you taste the flesh and sweat of the one that you love / Do you feel like a cannibal?" 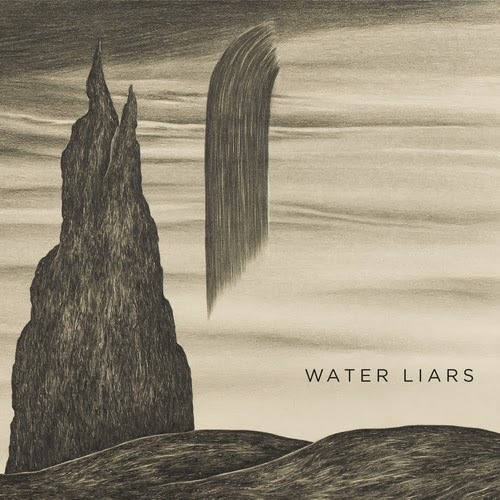 To a slightly lesser extent than the sad, sad Wyoming, this album explores the theme of what we are willing, able and sometimes driven to do to one another, and definitely deliver more questions than answers. It's definitely Southern music. In places it's languid and slow, and lead singer Justin Kinkel-Schuster definitely delivers the vocals with a drawl, but in other places it's urgent and as hard as guitar rock gets. "Swannanoa" is pretty much straight-ahead country music, with piano and vocals up front, and "Let it Breathe" is a pretty finger-picked folk song. But they plug in on tracks like "Tolling Bells", and often really turn up the guitar feedback. They're highly recommended for fans of literate guitar rock artists like Centro-Matic and My Morning Jacket... If you want to learn more about them (or read what a better writer than me thinks of their music), check out William Boyle's excellent bio on their website. The album is out now (released Feb. 4) on Fat Possum/Big Legal Mess Records. It wouldn't be fair for me to complain about winter. I like skiing (alpine and Nordic), skating and snowshoeing. But I'm not immune to the periodic mini-depressions resulting from short days and cold rain. However, as an experienced winter person, I have an antidote - bright, clear, upbeat pop music. And it really doesn't surprise me at all that very often the source of such music is a band from a Nordic country. 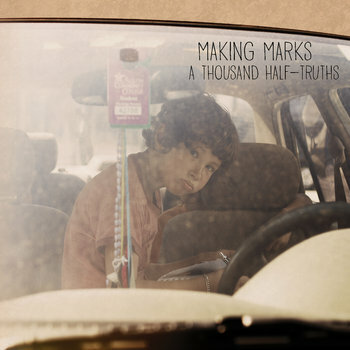 Today's medicinal recommendation is A Thousand Half-Truths, by Norway's Making Marks. With gentle, affecting vocals, memorable melodies and broad instrumentation, this album delivers a healthy dose of sunshine to nearly all users in our test audience. The only known side effects are good moods, humming, additional energy and evangelical fervor in recommending the album. If a wide grin persists for more that 24 hours, see your dentist for teeth whitening. The male/female vocals and jangling guitars are standard in this genre, but Making Marks takes a step toward the head of the class with their delicious hooks and their adventuresome use of banjos, ukuleles, harmonica and glockenspiel, providing for a rich listening experience. There is a bit of Belle & Sebastian, but a sheen of county-inflected folk, as well. Survive winter - experience Making Marks. Making Marks is based in Oslo, and is comprised of Ola Innset (guitar/vocals), Nina Bo (vocals/keys), Marie Sneve (bass) and Jorgen Nordby (drums). A Thousand Half-Truths is out now on Fika Recordings. Law is Lauren Holt, an Edinburgh-based musician. Her debut EP is Haters & Gangsters, and provides a taste of her talent and the breadth of her art, and leaves you wanting more. The songwriting concepts are bold and well realized, and the hooks, beats and production -- with the right balance of fuzz and clarity -- are top quality. But the star is Law's vocals. With a hint of grit and a slight drawl, it adds a dose of clear-eyed realism to the frank lyrics. Whether she is sounding weary and struggling, or fierce, she commands your attention. And today is your lucky day, as the EP is available for free download at the Soundcloud link below. It begins with "Haters", a track that combines soul and rap over a skittering rhythm. The following six tracks represent hip-hop, soul, rap and dream pop. But for me the EP suggests a fresh and welcome update of R&B. And if this is the future, sign me up. Law is from Leicester, but has been based in Edinburgh for several years. To my delight, '80s underground heroes -- and one of the harder-edged groups tagged with the C86 label -- The Wolfhounds continue their comeback with their latest single for Odd Box Records. "Anthem", the first track on the double A-side dishes out thick guitar riffs and swaggering vocals. "Middle Aged Freak" quite simply is a bad-assed rocker. This release is exhibit A for the theory that bands don't need to get soft and quiet as they age. The Wolfhounds show that they can just get better at delivering the rock. The music scene in tiny Walla Walla, Washington has gifted the music world two excellent bands recently. One is Chastity Belt, whose No Regerts (no, that isn't a typo) was justifiably lauded last year. Now it is the turn of another Walla Walla-to-Seattle transplant, and lablemate of Chastity Belt and Wimps at Seattle's Help Yourself Records, Dude York. A trio consisting of Peter Richards (guitars/vocals), Claire England (bass/vocals) and Andrew Hall (drum/organ/piano), Dude York has been stoking our Pacific Northwest ears for several years, but with Dehumanize I think they deserve to earn a much larger audience. This is the kind of band that shows up looking young, put together and maybe a bit bratty, but then blows away all the headliners. With all the right influences, excellent musicianship and songwriting, and the ability to personalize it all into a positive and distinctive rock statement that, in my mind, makes them one of the two most exciting Seattle bands playing today. The album opens with the punky, crunchy rock of "Sleepwalk". No Seattle beard rock, pop or electro here. This track says welcome to our rocking world. And just as expectations are set, the band lays down the infectious hooks and soulful groove of "Hesitate". At this point, I'm two tracks in and I completely hooked. Track three, "Iris", is a '60s AM radio throwback, with sugar-coated ooohhhs and aahhs on a garage rock skeleton. "Idol" is a slick rock tune that begins with a disciplined rhythm and guitar frills that reminds of Fleetwood Mac, but audaciously adds a thumping rock chorus between the verses. The ballad "Heartland" follows with a slower pace but red-line intensity. "Burning" takes us back into enthusiastic rock territory. A searing song, it reminds us of just how good Dude York is with their instruments. Thematically, we may go back to middle school with "Eighth Grade", but musically this track continues the rock assault of the preceding tack. At this point we may well be jumping up and down and pumping our fists. But we don't tell anyone that because we need to be professional and objective. "Believer" is a near perfect slice of upbeat rock. You may well want to sing along, and I expect it will have you searching for local performances of the band. Don't be embarrassed, I assure you that it is a natural reaction, and while I am not a doctor, I have seen the movie M*A*S*H numerous times. And like a good book, Dehumanize pulls it all together on the final track, "Dehumanize Yourself and Face to Bloodshed". Snaky grooves, slashing guitars, hooks and noise -- it is one of my favorite songs of the year so far. Dehumanize is out now on Seattle's Help Yourself Records. New Guitar Rock Discovery: The Silver Palms - "Superstar"
If you look in the video, there's a link to sign up for their newsletter and get a free download of that one.